Weleda's Organic Birch Juice is an organic health supplement to help you detoxify your body, healthily and naturally, and improves the appearance of your skin. As well as helping you rediscover your vitality, a detox programme also brings beauty benefits : cleansing your system purifies the complexion to leave skin clear and bright. Weleda's Organic Birch Juice is made without added sugar or honey, contrary to Weleda's Organic Birch Elixir. 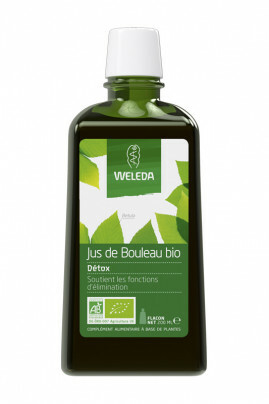 Dilute a tablespoon of Weleda's Organic Birch Elixir in water or tea, 2 to 3 times daily, before meals. A 3-6 week course is recommended to help improve vitality. For maximum benefit, cleansing can be complemented with Weleda's revitalising Organic Sea Buckthorn Juice.